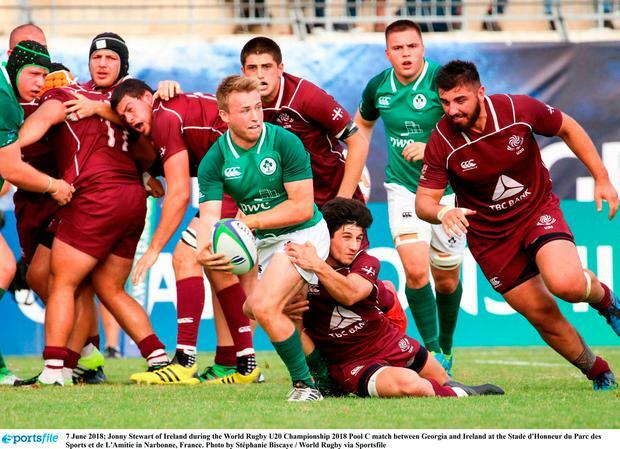 Ireland U-20 coach Noel McNamara said have no choice but to regroup and battle it out in the lower tier next week after a shock loss to Georgia last night at the World Rugby U-20 Championship. Ireland will now battle it out to avoid relegation to the World Trophy next week in their two concluding games as Georgia celebrated their first ever pool win in this competition. And they were full value for their win, with Ireland's display camouflaged by two late tries. "We scored two tries late, but it was too little too late. We are not interested in moral victories," said coach Noel McNamara. "There were so many aspects of that game that were so frustrating for us. We conceded two tries either side of half-time. The intercept when they were down to 14. And straight after half-time where they got a breakaway and from deep inside their own half. "You give teams 14 points so easily like that. We obviously had a number of opportunities, passed forward over the line, knocked-on over the line, double movement over the line, got held up over the line but we didn't do enough to win it." Ireland again didn't help their cause with basic errors and Georgia, precise in everthing they did, punished them time and again through a typically formidable pack and a backline that was exciting and sharp. Ireland found themselves 17-3 adrift after just 22 minutes, conceding a good try from Georgian lock Arsen Machaladze after eleven minutes and then a killer breakaway effort from his own 22 by centre Sandro Svanidze, both converted by outstanding scrum-half Gela Aprasize. Ireland, with captain Caelan Doris leading the way, got back into contention when Conor Dean finished off a nine-phase move to cut the gap to 17-8 at the interval. But any hopes of staging a comeback disappeared four minutes after the restart when Georgia out-half Tedo Abzhandadze finished a move started inside his own 22. Ireland's luck on the night was summed up by three TMO decisions going against them in the second-half and by the time tries came it was much too late. It all summed up a frustrating and bitterly disappointing night for the Irish who must regroup for the 9-12th place play-offs. Ireland did managed to finish well with Dan Sheehan getting over for a late try and replacement tighthead, Polish-born Kuba Wojtkowicz, scored on his debut in the final play. But it didn't little to lift the gloom on a third loss in the competition as Ireland failed to win a pool match for the second year in a row. Ireland – P Sylvester (Munster); P Sullivan (Leinster), T O'Brien (Leinster) (J McCarthy (Munster 45), J Hume (Ulster), S O'Brien (Leinster); C Dean (Leinster) (H Byrne (Leinster 57), H O'Sullivan (Leinster) (J Stewart (Ulster 67); J Duggan (Leinster) (B O'Connor (Munster 71), D Barron (Munster) (D Sheehan (Leinster 71), J Aungier (Leinster) (J Wojtkowicz (Connacht 71); M Dalton (Ulster) (C Daly (Leinster 62), J Dunne (Leinster); A Hall (Ulster) (M Agnew (Ulster 60), J Daly (Munster), C Doris (Leinster). ref –Jamie Nutbrown (New Zealand).